Full Length: 113cm; Blade Length: 90cm. The Firangi is an Indian weapon used by the Maratha tribes who made them with the blades of the swords that the Portuguese imported from Europe – hence the name firangi meaning foreigner –, or were produced locally but imitating their characteristics. In accordance with what is said here, this kind of sword always presents a double edged blade, straight and quite long, usually with three or four reinforcement fullers in order to be able to be used with both hands. Usually the hilt would follow a traditional Indian model with a large cup in the shape of a basket and a hand guard connected to the circular pommel and ending in a long spike. 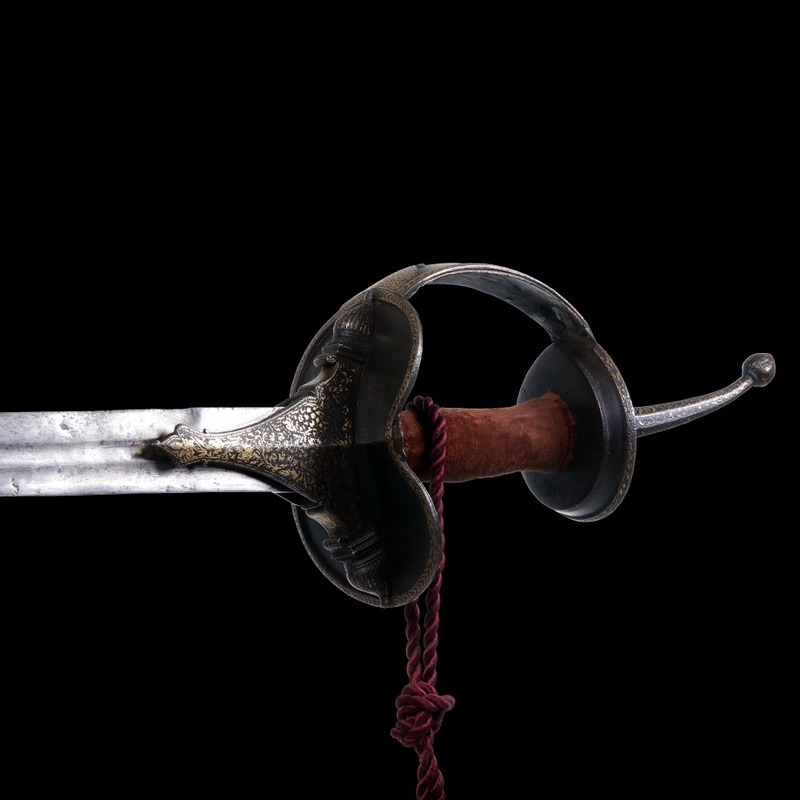 This particular piece shows that traditional European-made blade and a tempered steel hilt with an engraved and gold incrusted floral decoration near the pommel and base of the spike, the grip is covered in fabric. Bibl. : Bibl. : George Cameron Stone A Gloss. Of the Const. And Use of the Arms and Armour ISBN 0-486-40726-8 (pbk) Pag.nº229 fig.nº283. Islamic Weapons Maghrib to Mogghul ISBN 0-9747192-7-7 Pag.315 fig.nº235/236. Published in the auction catalog 31 of 10th November de 2015, Marques dos Santos Leilões, pág. 98e 99.
comp. total: 113 cm; comp. lâmina: 90cm. O Firangi é uma arma indiana usada pelas tribos Marattas, que a fabricavam com as lâminas das espadas que os Portugueses importavam da Europa - daí o nome de firangi - donde estrangeiro -, ou então, estas, eram produzidas localmente, mas imitando as suas características. De acordo com o exposto, este tipo de espada apresenta sempre uma lâmina de duplo gume, recta e bastante comprida, habitualmente com três ou quatro sulcos de reforço para poder ser usada com as duas mãos. Usualmente, o punho seguia o tradicional modelo indiano com grande copo em formato de cesto e guarda-mão unida ao pomo circular, a terminar num comprido espigão. Este exemplar, exibe a tradicional lâmina de fabrico europeu e um punho em aço temperado, com uma decoração floral gravada e incrustada a ouro, junto ao pomo e base do espigão; a empunhadura está revestida a tecido. Bibl. : Bibl. : George Cameron Stone A Gloss. Of the Const. And Use of the Arms and Armour ISBN 0-486-40726-8 (pbk) Pag.nº229 fig.nº283. Islamic Weapons Maghrib to Mogghul ISBN 0-9747192-7-7 Pag.315 fig.nº235/236. Publicado no catálogo do leilão 31 10 de Novembro de 2015, Marques dos Santos Leilões, pág. 98e 99.